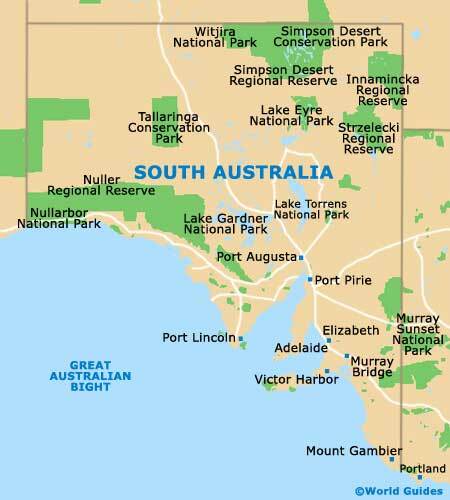 South Australia has something of a unique place in Australian history. Whereas other towns and cities were settled with convicts in mind, this was the only purpose-designed British colony in the whole of Australia. Kingscote on Kangaroo Island retains the honour of being the first colonised town in South Australia, although this pint-sized island town is perhaps best known as being the home of the smallest penguins in the world. It is Adelaide, the capital of South Australia, that draws in the crowds. Since those first European settlers arrived back in the 19th century, the city has grown into a rather desirable place to live, play and work. It boasts beautiful sandy beaches, elegant city squares and streets, enough events to fill up the average calendar the whole year round, and some mighty fine restaurants to delight the taste buds of the most committed of gourmets. For diners who like to accompany their meal with a nice bottle of wine, the renowned wine region of the Barossa Valley is rather fortuitously placed a short drive away. Decent wines have been emerging from this part of South Australia for over 150 years, with vines first brought here by the early settlers. The best known Barossa wines include some full-bodied Shiraz numbers, although there is more than enough opportunities to test them for yourself at one of the 60-odd wineries that open their doors to touring wine lovers. If it is seafood that you are interested in rather than wine, then skip Barossa and head straight to the Eyre Peninsula. The peninsula is dotted with some picturesque fishing spots. Whales breed in the waters around the peninsula and great white sharks make an appearance every now and then. With that in mind, it is best to choose where you dip a toe in the water very carefully.